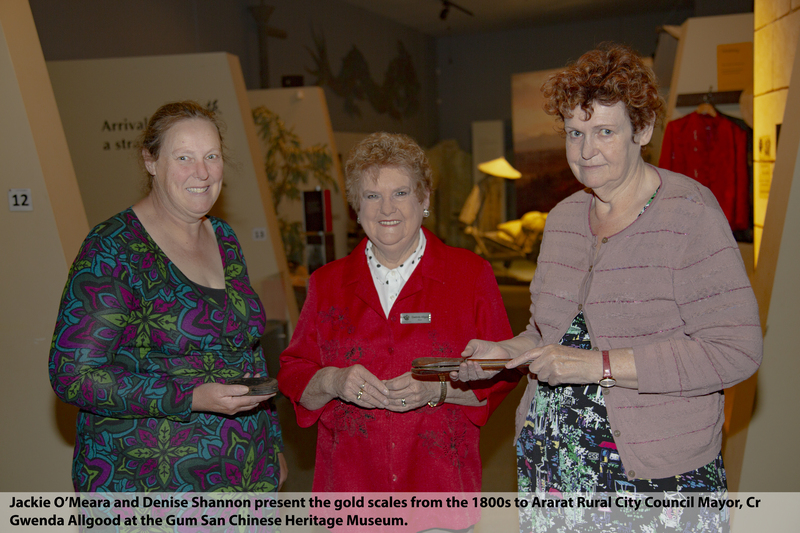 A special set of gold scales from the 1800s has helped add to Gum San Chinese Heritage Museum’s significant and historical collection. The loan was made by sisters Denise Shannon and Jackie O’Meara to Ararat Rural City Council Mayor, Cr Gwenda Allgood on Friday. The two gold scales, which were used on the Ararat Goldfields during the height of the gold rush, have been in the sisters’ family for generations having been handed down to their father from their grandfather John Young. Denise and Jackie were cleaning out their home when they came across the scales and felt that the significant artefacts should be properly cared for and on display for Ararat community. Ararat Rural City Council Mayor, Cr Gwenda Allgood said it was a pleasure to accept the scales on loan from the family. “To add these historic items to the already impressive collection we house at Gum San is a big thrill,” she said. “To think these scales were used almost 160 years ago during the peak of the gold rush in our town is quite amazing. Gum San Chinese Heritage Museum is open from 11.00am to 4.00pm, seven days a week. For more information, visit www.ararat.vic.gov.au/gumsan or phone 5352 1078.